Where are the jobs? Who is hiring? Over the past few years, many for-profit colleges and trade schools (also known as vocational or job training schools) have come under increased scrutiny for misleading students about their job prospects after graduation. These schools have been accused of marketing false job placement rates, using misleading recruitment practices and providing fraudulent accreditation credentials, all while charging students high-priced tuition and fees for degrees that prove worthless in the job market. For-profit colleges target low-income students (often single moms, people of color and veterans), many of whom are the first in their family to attend college and don’t always have the skills to judge a school’s financial aid practices and recruitment efforts. Since these schools often fail to help graduates find good-paying jobs, many for-profit school graduates struggle to pay back the student loans they took out for tuition. Government officials, like the U.S. Department of Education, the Federal Trade Commission and the Consumer Financial Protection Bureau, are targeting for-profit-school misbehavior. After an investigation by the Department of Education, Corinthian Colleges was found guilty of lying about recent graduate job placement rates (e.g., counting fast-food workers as graduates who found jobs in their field of study—accounting). Corinthian Colleges was fined $30 million, filed bankruptcy and shut down its remaining campuses, leaving thousands of students on the hook with no degree and tens of thousands of dollars in student loan debt. Less than two years after Corinthian made its school closure announcement, ITT Technical Institute closed all 130 of its campuses. The decision came after months of sanctions and years of investigations and lawsuits filed by the Department of Education, the CFPB and the Securities Exchange Commission. The agencies’ charges included predatory student lending and various cases of fraud. Other large for-profit chains that have been investigated for fraud include University of Phoenix, DeVry University, Education Management Corporation (Art Institutes, Argosy University, South University and Brown Mackie College) and Career Education Corporation (including its Le Cordon Bleu campuses, American InterContinental and Colorado Technical University). If you want to make smart choices about selecting and paying for a higher education program, or you’re worried that you could be getting involved with a fraudulent for-profit school, this guide is for you. It is designed to help students and job seekers get the best training without crushing debt, avoid fraudulent schools and know where to turn if you believe you’re a victim of for-profit school fraud. 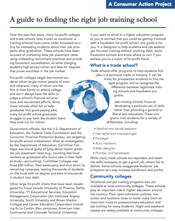 Trade schools offer programs to help students find jobs in a particular trade or industry. It can be tricky for prospective students to find the right program and to recognize the difference between legitimate training schools and fraudulent programs. While many trade schools are reputable and teach the skills necessary to get a good job, others fail to deliver. Some schools exaggerate students’ job prospects as a way to increase enrollment and profits. Websites like USAJOBS.gov, America’s Job Exchange, Indeed and CareerBuilder provide information about job availability in your area. The U.S. Department of Labor’s CareerOneStop lets you explore careers, research salaries, browse links to training resources and learn about employer demand for certain jobs. What training is required for the job you want? Once you find a job or industry that suits you, you’ll need to see how well you qualify. Check multiple job postings in your desired industry to learn about the qualifications, required skills and degrees you might need. If you need additional schooling or training, contact your local community college to see if they offer that education before you look into more expensive training programs. If you need help finding a community college or trade school in your area, or if you want to evaluate the school you are considering, check with the Department of Education’s College Scorecard and College Navigator. Both sites provide a wealth of information for students and families, including reliable data on enrollment, cost, graduation rates, student loan default rates and campus security. Make sure the program you are considering is accredited, or verified by an independent, legitimate authority that ensures the school provides an education that meets certain standards. Many colleges and universities won’t accept transfer credits from schools without recognized accreditation, and future employers typically hire only applicants with degrees from an accredited program. Both investigate accreditors to ensure they are using appropriate standards when evaluating schools. Students can use federal student aid only at schools accredited by agencies recognized by the Department of Education. Ask reputable two- or four-year colleges if they accept credits from the school you’re considering. If they don’t, it may be a sign that the vocational school is a fraud. For more information about the types of accreditation and why they’re important, visit our companion Q&A. Before you enroll in any job training course or program, make sure you get answers to the questions below. If this seems like a lot of work, consider it an investment in your future and a way to increase your chances of landing that dream job! What are the school’s requirements for admission? Some requirements may include having a GED or high school diploma, being a certain age or living in a certain city or county. Do you meet the school’s criteria to attend? How long will you need to be in school to complete the program? Both part-time and full-time students should ask the school how long it takes to complete the program. Is help available for overcoming language barriers and learning disabilities? If you are dealing with a language barrier or learning disability, determine if the school provides help, and at what cost. Are there supplies and tools that you must buy to help you complete your courses, and what are the approximate costs? Does the school provide the training demanded by employers? When reviewing relevant job postings, take notice of any job requirements, necessary degrees or training listed. Call the employers from the job postings to learn what kinds of training and experience they find important and ask whether they can recommend any particular training programs. Does the program you’re considering meet the same training or licensing requirements? Are the instructors qualified? Check the program’s website or ask the school for teacher biographies and resumes. Do the teachers work in the industry you’re interested in? Do they give talks or hold seminars elsewhere? Does their line of work require certification or a specific degree? Check with the proper professional association (such as the American Association of Colleges of Pharmacy, the American Health Care Association, the Institute of Electrical and Electronics Engineers, the American Dental Association, etc.) to see if the teachers are currently certified or have any complaints filed against them. Use a search engine to learn if the professor has published any work (in many academic fields, professors are judged by the studies, papers and books they publish). Are the facilities state-of-the-art? Vocational and trade schools often have some of the latest technology and equipment that is used in the industry. Avoid those with outdated labs and training equipment. When you enter the workforce, you’ll often be required to jump right in and operate state-of-the-art equipment, and the vocational school you choose should be able to prepare you for that. What is the program’s success rate? The admissions department of any school or program will have graduation and employment rates available for review—but don’t assume they are accurate! Follow up with questions to the school’s admissions office. Getting answers will help you better understand whether the investment in the area of study you are considering is worth your time and money. Job placement: How many graduates find full-time, paid jobs in their chosen field? What is the average starting salary? Do any degree areas have more success finding jobs than others? Debt upon graduating: Of the recent graduates who borrowed money to attend the school, what percentage are delinquent in paying back those loans? Alumni: Can the school provide you with a list of recent graduates to contact so you can interview them about their experience with the school and with working in the industry? What job placement services are provided to students and graduates? Inquire about mentoring programs, internships and in-house job boards. Is the school willing to put students in touch with program alumni who might be good contacts for jobs in your area of study? Are there complaints? Check with the attorney general’s office in the state where the school is based and with that state’s department of education. The Federal Trade Commission warns that a lack of complaints doesn’t necessarily mean the school is without problems: “Unscrupulous businesses...often change names and locations to hide complaint histories.” So enter the name of the school plus the word “complaints” in a search engine, and check the Better Business Bureau for any complaints filed with it against the school. Are you allowed to review your contract BEFORE you sign? Read the school’s materials and contract carefully. If the school refuses to give you documents to review beforehand, walk away. A legitimate program shouldn’t pressure you to sign up. If a school’s promises aren’t in writing, they will be difficult to prove if things go wrong. Asking these questions can help you avoid “degree mills”—dubious programs offering bogus certificates and degrees. Thoroughly vet the school or program before you enroll so you don’t waste your hard-earned money and time on a fraudulent program that won’t give you the qualifications you need to land a job in your chosen field. What is the total cost of the program? This should include tuition, enrollment fees, books and other class materials. Also consider costs related to attending school, including transportation, housing, childcare and meals. Financial aid and loans. To pay for a training program, you can apply for financial aid through the school’s financial aid office. Ask about state and federal government grants you might qualify for, such as the federal Pell Grant program, which offers both grants and the opportunity to earn money through Work-study. If you still must borrow money to attend school, ask if you can apply for a federal loan rather than a private loan. The federal government funds federal loans, which often have better terms than private loans (such as lower, fixed interest rates and flexible repayment options). Lenders, like banks or even schools, offer private loans. The interest rates on private loans can be as high as 18% and they don’t offer hardship, forbearance or deferment options if you have trouble making payments. Find out more about the differences between federal and private loans here. Remember: You’re responsible for paying off the loan whether or not you graduate from the training program. Failure to repay your loan can lead to serious credit problems, making it difficult for you to buy a car, a home or open a credit card. Your employer may be required to deduct payments from your paychecks automatically, and the IRS could confiscate your federal tax refunds. For information about the limited instances (including fraud and school closure) in which students may be granted loan forgiveness, see our Q&A. GI Bill for job training programs. For eligible veterans, the GI Bill covers the full cost of an undergraduate education at any public university or college and many private schools. The GI Bill also is available for use at vocational training schools. Entitlement amounts for attending college vary based on how long the veteran has served, the program and the school. GI Bill payments are issued monthly to the veteran and are based on the number of hours they attended training during the month. A monthly housing allowance is paid based on the location of the school, and veterans may be eligible to receive monthly stipends for books and school supplies. Use the Veterans Administration’s school locator tool to find programs that are eligible to accept veterans education benefits. Tuition Assistance for job training programs. The Tuition Assistance program is offered by the individual service branches and available to active duty, National Guard and Reserve Component servicemembers. The program pays up to 100 percent of tuition for semester hours costing $250 or less (or $166 per quarter credit hour), not to exceed $4,500 per fiscal year (Oct. 1 through Sept. 30). Courses and degree programs may be academic or technical and can be taken from two- or four-year institutions and from vocational and technical schools. The program’s accrediting organization must be recognized by the Department of Education in order for the training to qualify for Tuition Assistance. For more information about Tuition Assistance, including how to enroll, visit Military.com. Military Lending Act and student loans. As of October 2016, if you’re an active duty member of the armed forces or are on active Guard or Reserve duty, the Military Lending Act (MLA) prevents lenders from charging you an interest rate higher than 36% on private student loans (loans issued by financial institutions, like banks, or your school—not the federal government). It also prevents lenders from requiring that you waive certain legal consumer protection rights and forbids the lender from forcing you to commit to an arbitration clause in your contract. For more information on your rights under the MLA, visit the Consumer Financial Protection Bureau’s website. Apprenticeship and job training. Vocational schools and community colleges frequently partner with local companies, trade unions and professional organizations to provide classroom training and on-the-job experience for skilled workers. Apprentices earn industry wages for work, typically at the journeyman pay level. Some community colleges and many technical schools combine trade apprenticeships with formal degrees in applied sciences, including multi-occupation trades. These degrees require coursework outside the trade in courses that complement job skills, including communication, writing composition, mathematics and psychology. Visit your state’s department of labor or department of education website for more information about apprenticeships available in your area. You can also visit the U.S. Department of Labor to learn more about these opportunities. For-profit schools have been known to lose or get rid of important documents once students graduate, saying the records go “too far back” to keep. If you’re still attending the school, make sure you keep everything, and if you’ve already graduated, make sure you organize the records that are available to you. It can be very difficult to get documents upon requesting them from the school unless you make it clear that you will bring their refusal to the attention of the U.S. Department of Education. To find out if you are eligible to cancel or discharge your student loans, read that section in our companion Q&A, and visit the Consumer Financial Protection Bureau’s web page on student loan forgiveness. Consumer Action created this guide with funding from its Managing Money Project.